New for 2012. The Panasonic TC-L55E50 Series 1080p LED TV is Panasonic’s 55-inch mid range TV. It is perfect for bedrooms, dens, and small living rooms where you would like to have an HDTV. Although value priced, it comes with some added features such as Edge Lit LED backlight, Full HD, IPS LED Panel with 178° wide viewing angles, WiFi Ready, and more. With its 120Hz refresh rate, along with a 3-phase backlight system, this TV can minimize image blur during fast action. Panasonic Viera Connect Apps: The Panasonic TC-L55E50 provides online Video on Demand services by pressing the Internet Button on the remote control (Including Netflix, Hulu Plus, Amazon Video, Youtube) Also Facebook and Twitter with Viera Connect Apps Navigator. VIERA remote App: allows you to control your TV using a smartphone or tablet. Connectivity: Plug in up to 4 HDMI devices (such as a DVD or Blu-ray Player, DVR, or Game Console). Includes NTSC, ATSC HD, and QAM tuners. DLNA CERTIFIED® to connect to the content of your home network. PC input. The Viera TC-L55E50 has a built-in SD memory card slot and 2 USB ports, so you can view pictures, music, or HD video on your TV from your digital camera, USB device, or camcorder. The new LED panel uses up to 25% less energy than last year’s model. Smart-Review Commentary: Panasonic has made some of the finest LED TVs recently, which complements its top rated Plasma TV line. 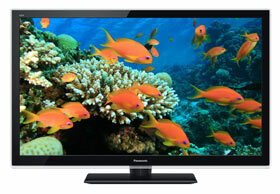 This 55-inch E50 series TV is one of Panasonic’s best for 2012. This model does not have all the frills of some of the larger TVs, but does have the essential features that you would look for, and most importantly, a great pictures. Essential Features include: Full HD 1080p, LED backlighting, Video on Demand and Internet Apps, 4 HDMI connections, and DLNA connectivity. The set is Wifi Ready. You must purchase the TY-WL20U Wireless Adapter separately. In addition to excellent consumer reviews, we also note that the TC-L55E50 has a built-in SD/SDHC memory card slot and USB slots to play your own photos and video. You can control this TV with your Smart Phone or Tablet. Energy Efficiency has been greatly improved, and these models use 25% less electricity than last year’s model. For 2012, this is a SmartReview “Top Value Pick” in 55-inch TVs. Upgrade Option: Panasonic TC-L55ET5 Upgrade: Adds built-in Wifi (nothing to buy), 3D capability with 4 pairs of 3D glasses, illuminated remote.